THIS CRANING LARK IS DOING MY HEAD IN! Last night's race preparation got off to a bad start, what with a low tide the craning in of the Melges becomes a little harder (for an old man like me). As the boat was craned down to the water I had to go down the slimy ladder holding the painter! Glad I was wearing my Dubarry boots & Gill gloves to give me a bit more grip. 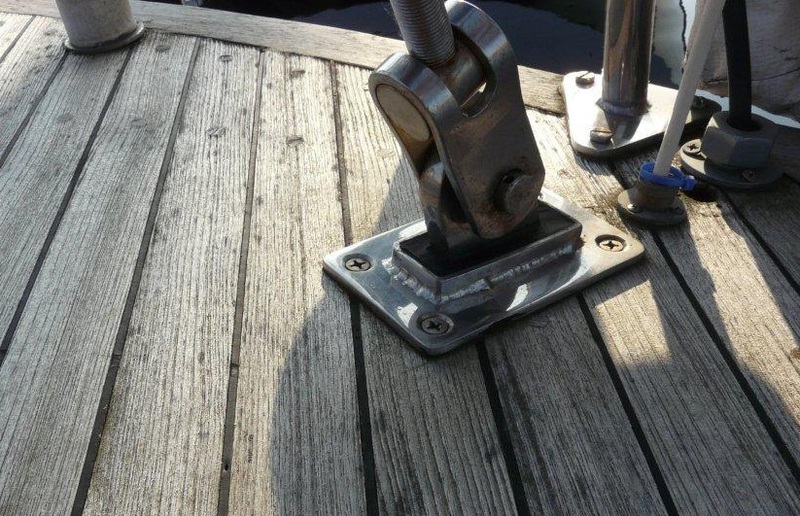 Once you are 'under' the crane, keeping the backstay & flicker away from the chain & the chain box is my worst nightmare, having said that they do say practice makes perfect. Speaking of practice we did manage a port end flier & cleared the fleet however we were second at the windward mark & as for our first spinnaker hoist & subsequent gybe the less said the better! Looks like we may have finished third on corrected time, beaten by a couple of other Melges. Practice, plus maybe some Team Mclube Hullkote, needed to give us a 'winning' finish. 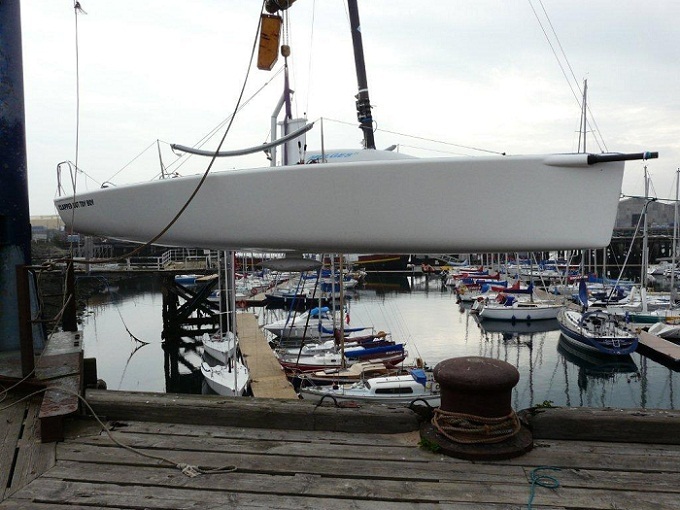 This entry was posted in Race News and tagged Dubarry, Gill, Harken, Hullkote, McLube on May 31, 2012 by Iain Forrest. Wondering what happened to race no 3 & 4? Avid readers of our blog must have been wondering what happened to race no 3 & 4 of our Wednesday night series, true to form for race 3, run on the evening of the 16th of May we were again running late, however this time we did manage to check the kite out down wind & actually make the start! Our tacktick must have stood us in good stead cos we won the start (however maybe it was beginners luck) & rounded the windward mark just behind our main opposition another Melges 24. Our first hoist in earnest wasn’t that slick & after that slow one they did get a little better, however looking back on the race our biggest problem was the nut on the tiller, ME! Our tacking, or should I say mine needs a lot to be desired, maybe a Spinlock adjustable length tiller extension will be the way forward! When the handicaps were worked out we had finished third, some two minutes behind the winner. Aufwiedersehen Pet the other Melges. Race no 4 run on Wednesday the 23rd was sailed in extremely light winds, yours truly arrived at the club with plenty time to spare, however after being grabbed by three RNYC members once again I found myself short of time to prepare & crane her in however with the windmills on the South pier not turning & the majority of the mast head paddle wheel transducers not turning, a corporate decision was made to get back to work & try & catch up; Gill needed ordering, Henri Lloyd tidying up & Musto unpacking. Apparently they did run the race, however it was for a Wednesday night it was a long/slow one, the eventual winner was not back in the marina till way past nine pm! This entry was posted in Race News and tagged Gill, Henri Lloyd, Musto, Spinlock on May 27, 2012 by Iain Forrest. Only 8 had no faults! It seems we pay lip service to caring for essential safety gear. If you missed this opportunity to have your life jackets checked over, the RNLI lads will be back on site over the Jubilee Weekend 1st to 4th June. This entry was posted in Safety and tagged lifejacket, RNLI on May 25, 2012 by Iain Forrest. Was asked the other day to check the backstay tension on a 55 footer, owner thought it was a lot slacker than it should be. First thing I noticed that the starboard rigging screw did not have any split pins in place, second thing there was some pvc tape on the rigging screw thread & that there was a distance of 25mm between the edge of the tape & the rigging screw body. To my way of thinking it looks as though the backstay had been slacked off to enable it to be removed last time she was lifted out by the travel hoist. On the port side there is a hydraulic backstay adjuster which even when adjusted did not give sufficient backstay tension, however what made my jaw drop was the fact that the clevis pin that held the adjuster in place did not have a split pin to secure it, I shudder to think what would have happened to the rig if the pin had come out! Anyway I lubricated the rigging screw threads with Lanocote, wound the rigging screw up to the pvc marker & pumped up the hydraulic backstay, great tension. I then made sure that new split pins were put thru, bent over & covered with self amalgamating tape. This entry was posted in Tips and Advice and tagged Lanocote, Self Amalgamating Tape, Split Pin on May 25, 2012 by Iain Forrest. A customer recently received a new Navionics chart 28XG for his Raymarine A57D chartplotter. However try as he might, he could not get the chart up on the display and was getting quite frustrated at the lack of 'plug and play' as it was supposed to be. The operator's manual was of course not a paper document he could refer to, but on a CDROM and his laptop was at home, not on the boat! After going round in circles for a while he hit on the 'restore factory defaults' menu. Yup, that fixed whatever it was. If you are really stuck, try to restore the factory default settings and go from there. This entry was posted in Electronics, Tips and Advice and tagged tip of the day on May 24, 2012 by Iain Forrest. If it looks too good to be true - it probably is. . . This entry was posted in Electronics and tagged Chartplotter on May 24, 2012 by Iain Forrest. Speaking of the Royal Northumberland Yacht Club, the other night was the start of their Wednesday night series, which we are determined to win. However on last night’s showing we will be bringing up the rear end! In my wisdom we decided to sell the Flying 15 & with a small cash adjustment, join in Div 1 and enjoy a bit of class racing with the other Melges 24 based at the club. We collected the boat Monday, on Tuesday by nine that night we had the mast up, loads of spare string & various wires and truck loads of sails, but that’s another story. Come Wednesday evening with a race starting at seven, I was wishing that I had jumped ship & started rigging her by 2am. Could we find the pin for the gudgeons & battens for the jib! Well, we hit the race course only forty minutes late had a sail around, discovered we had rigged the kite wrong etc etc. What made a bitterly cold night better was that I was wearing my Dubarry Tornado Aquasport for a good grip but being the crafty old sod that I am had worn them over a pair of Sealskinz breathable & waterproof socks, brilliant they were, even though our performance that night was not. Ps, check out the new Sealskinz Sou'wester which we now have in stock, would have been perfect for wearing on Wednesday night! This entry was posted in New Products and tagged Dubarry, Sealskinz on May 4, 2012 by Iain Forrest. What are you doing this weekend? Up to Low Newton-by-the-Sea to sample the real ale & home cooking in the Ship, or maybe down the coast to Whitby to enjoy the fabulous fish & chips, mushy peas, tea, bread & butter at the Magpie Cafe. Navigation is easy these days with your plotter & the backup of an Imray C24 chart. But don't forget the very excellent Royal Northumberland Yacht Club pilot book! Superb attention to detail in the chartlets based on June Miller's drawings, excellent colour photographs & of course it can be updated by logging onto the RNYC website. This entry was posted in General Interest and tagged RNYC on May 4, 2012 by Iain Forrest. Notice is hereby given that there will be a restriction in channel width available off Riverside Quay South Shields on or around the 7th May 2012. The vessel “Rolling Stone” will be in an area approximately 100m off Riverside Quay in “DP” (Dynamic Positioning) mode. She will be receiving a shipment of rock from a “Stema Shipping” vessel secured on Riverside Quay. The operation will be carried out in three stages, approximately 24 hours apart and at all states of day or night. The operation means that there will be approximately 90m of channel available to the north of the “Rolling Stone”. All vessels wishing to pass the area should contact Tyne VTS on channel 12 to confirm the traffic situation. Passage should be made to the north of the “Rolling Stone” who will also be monitoring VHF channel 12. All craft should navigate with caution in the area. The “Rolling Stone” will be updated on expected commercial traffic for the period of the operation. Larger commercial traffic should contact Tyne VTS at least 30 minutes before planned passage to arrange for the “Rolling Stone” to cease operations and move the boom clear. 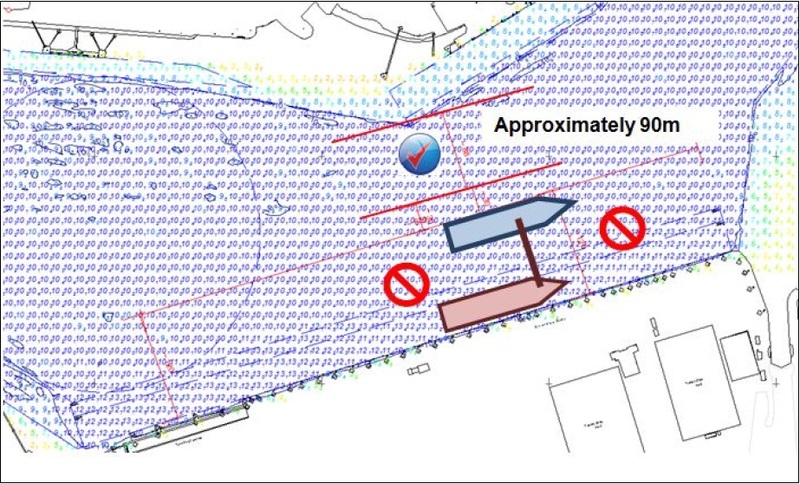 All vessels must not attempt to pass between the “Rolling Stone” and the “Stema” vessel on the quay. Vessels should also ensure that they pass the “Rolling Stone” at as slow a speed as is safe to do so and at least 30m clear. Smaller craft in particular should be aware of the thrusters causing wash from the “Rolling Stone”. This entry was posted in General Interest and tagged Port of Tyne on May 3, 2012 by Iain Forrest.